So sometimes… I get weird… and find it hard to post regularly? There it is. That’s my excuse for not posting an entry in a while. I get weird. Let’s hope I’m never on trial, ever. check it out, yo! the cabling, the buttonholes, the beauty! yes, we have exposed brick walls. be jealous. 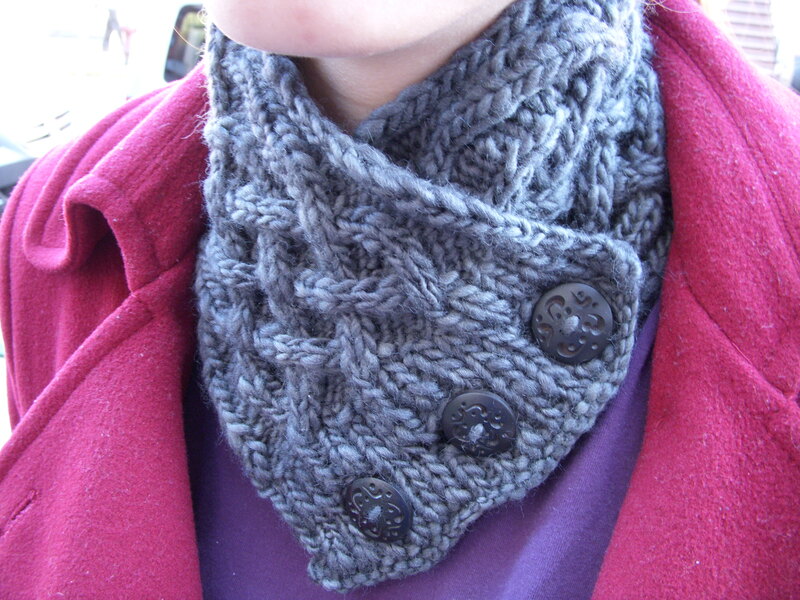 Anyway, here’s the pattern if you want to be a crazy person like me and want to kick off your knitting career with a neckwarmer that has CABLING EVERY OTHER ROW. You know what they say. GO BIG OR GO HOME*! Totally cool, right? Please tell me that it’s cool, even if you don’t think so, because I will straight up cry if you do not. 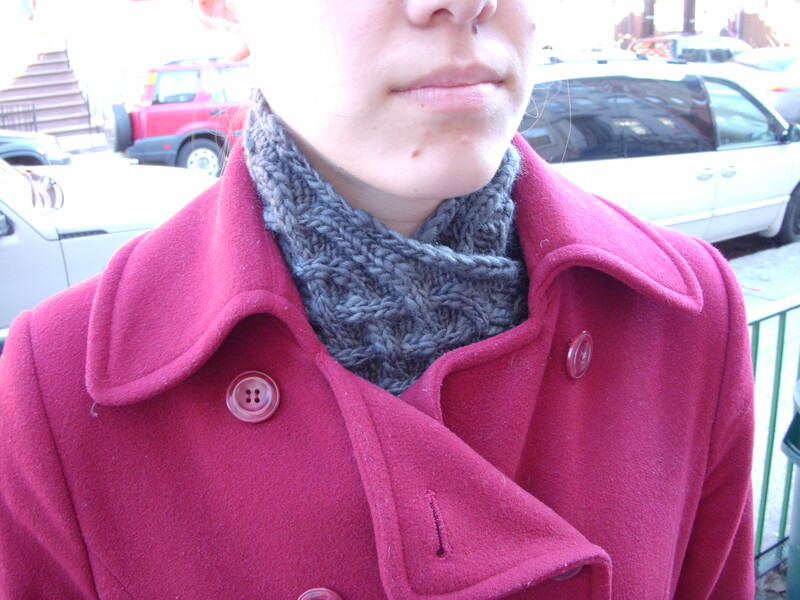 another shot of the neckwarmer, this time in the coat. lovely, yes? YES IT IS! SAY YES! OR I'LL KILL YOU! *Okay, I’ve never actually said that. And I’m not really the kind of person who would. I’m much more of the “GO BIG if you think you can and weather permitting and no one of note is watching” type of gal, but what can you do. 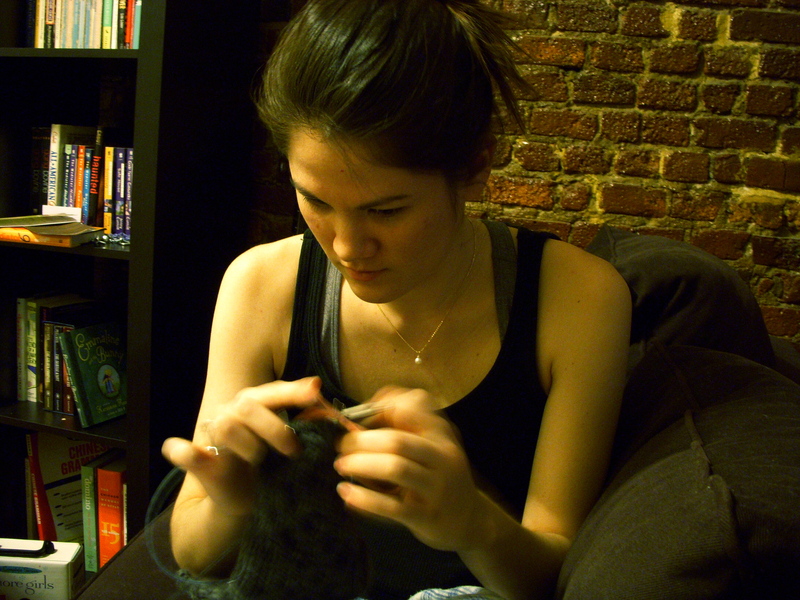 I’m badass… at knitting. yay! I’m so excited to wear it tomorrow! I’m sure I’ll receive envious stares all day…yes, I do mean ALL day. I will be wearing it inside the office. while eating pumpkin pie. for friends. SO COOL!! I am thoroughly impressed! And a little bit envious–knitting is a fairly useless hobby to adopt in Hawaii, no? P.S. I’m going to be in New York at the end of April/beginning of May. Can I come see you??? DUDE THAT IS INCREDIBLE! you are so badass summer and who ever thinks that that is not totally cool is a freak loser! its so pretty! hah hah yay for knitting! p.s. stop getting weird and post more! Wow, Grandma taught you well! Love it! The gray thing is cool. Very cool, in fact.